We had breakfast this morning at Brown's Restaurant at Nevis Bank Inn. Choice of main course for each of us. 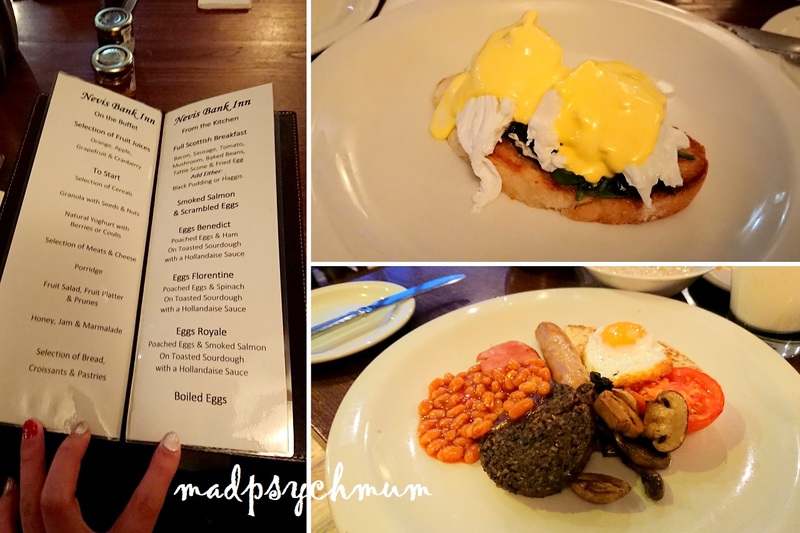 As usual we got Eggs Benedict and Full Scottish breakfast. 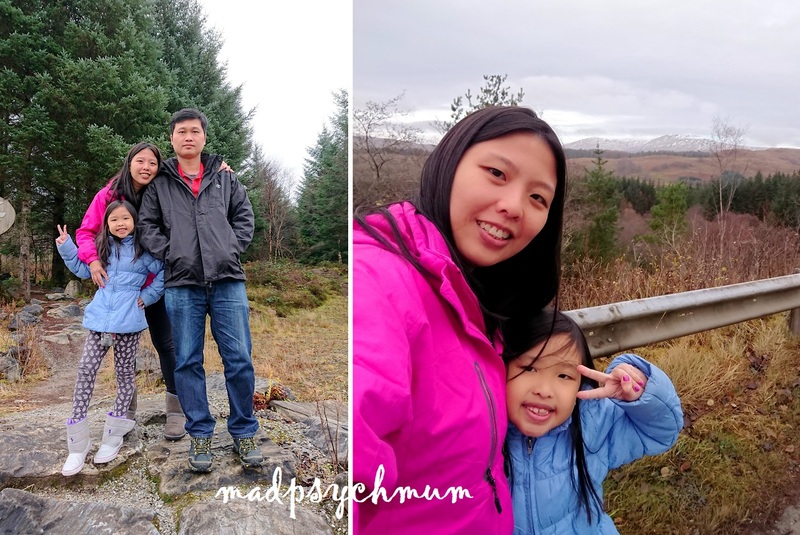 After breakfast, we checked out of the hotel and drove to Nevis Ranges Mountain Resort located on the mountain Aonach Mor, next to Ben Nevis. There is a Gondola (cable car) that usually brings you to the top of the mountain but unfortunately it was not in operation when we visited. I knew this when I checked the website but was harbouring some hope nevertheless. Ah well.. We decided to take some pictures in the area anyway since we were there. Since it was going to be a long drive back to Edinburgh, we decided to start heading back early. After travelling for about 2 hours, we got hungry and made an impromptu stop at Taste Perthshire because the hubby had a good feeling about the place (and he is hardly wrong when it comes to good food!). There was a real small playground next to the building and the girl insisted to play even though she has really outgrown it! Taste Perthshire seems to cater mostly to retirees. The food was ok, with hits and some misses. It was still a good place to stop over for a rest. We continued our journey for another 1.5 hours before arriving at our accommodation in Edinburgh, Apex City of Edinburgh Hotel. The hotel has very limited parking so we had to park at the public car park lots that lined the street outside the hotel. Thankfully it was Sunday and it was free to park till 8am the next morning. 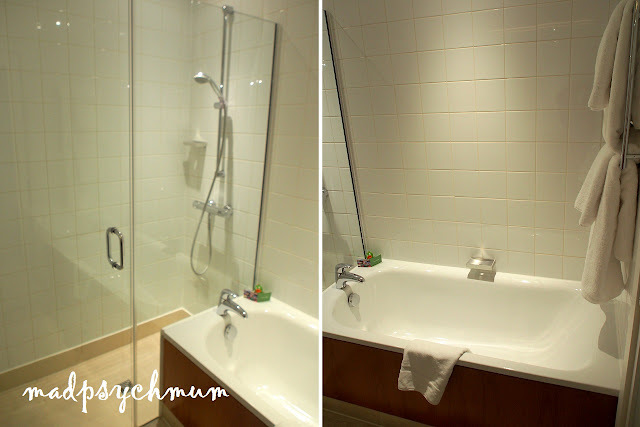 We booked 2 City Double Rooms this time as they didn't have the family-friendly option. We booked the rooms via Agoda and it cost us £84 per room per night, without breakfast. 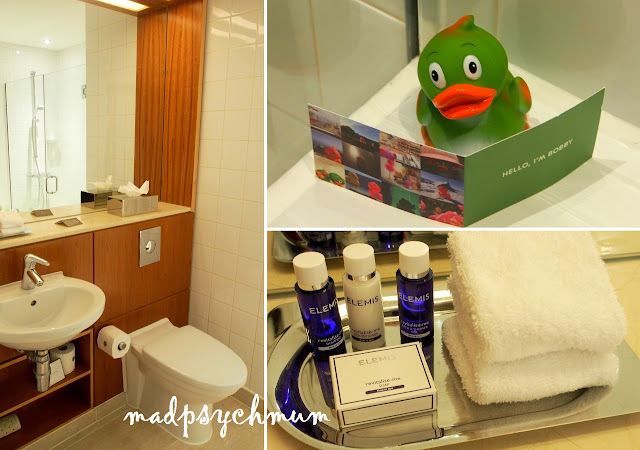 Bathroom with toiletries and even a rubber ducky for the kids to bring home! We quite enjoyed our accommodation as it was spacious and comfortable. We later decided to drive to Edinburgh Old Town for dinner, a decision that we would soon regret. It was a Saturday so the roads were very crowded with pedestrians and vehicles. Some roads also only allowed public transportation such as buses and taxis while other roads that allowed cars looked like pedestrian walkways. We were turning in circles around the town because we were new to it and took some time to understand how it works. To add to the frustration, we had a lot of difficulty trying to find a parking lot. By the time we managed to find a parking space in some back alley near our dinner place, we were exhausted and so ready to have a feast! "This Mussels Inn better be freakin' worth the effort!" I said. And thankfully, it was SOOOO worth the effort!! The hubby is automatically drawn to this restaurant, as their 'Passionate about Seafood' tagline is the same as his life motto! Yummy mussels soaked in white wine! 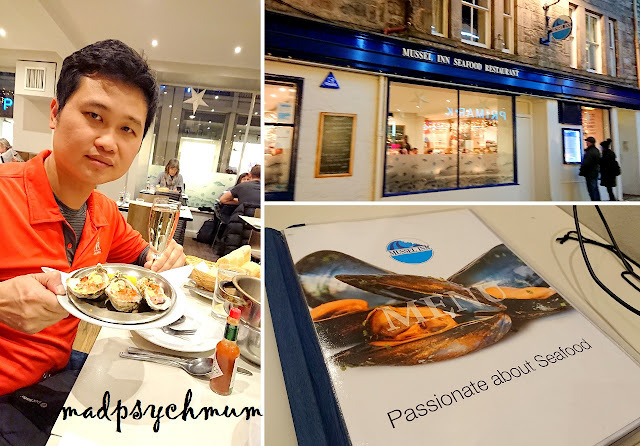 Highly recommended if you're visiting Edinburgh and love mussels!